BRUSSELS 4 December 2018. Europe’s beer production rose to an eight-year high in 2017 bolstered by record exports, a rise in micro-breweries and increased low-alcohol products. According to The Brewers of Europe’s latest report on Europe’s beer sector, production increased by 2 million HL 39.6 billion litres and exports reached an all-time high. Now one in five beers is shipped abroad, a third of that to outside the EU. With a production of 9.3 billion litres Germany was the top producer - one in every five beers produced in the EU originates from Germany, followed by the United Kingdom and Poland (both at 4 billion litres produced, each representing 10% of the total). German and Belgian breweries exported the most beer outside their countries, 1.5 billion litres each. Europe’s brewers call for a sustainable tax regime that recognises beer's positive impact throughout the value chain, from ‘grain to glass’. Throughout the value chain, our 9,500 breweries generate around 2.3 million jobs in Europe. Governments across the EU raise nearly €42 billion in tax revenues generated by brewing, including €10.9 billion in excise duties on beer. The 2018 edition of Beer Statistics was compiled from data collated by national brewers’ associations through surveys carried out by The Brewers of Europe and Eurostat. Eurostat trade data for 2017 can be viewed here. *Non-alcoholic beer is defined as beer that is 0.5% alcohol by volume (abv) or lower. About us: Based in Brussels, The Brewers of Europe brings together national brewers’ associations from 29 European countries and provides a voice to support the united interests of Europe’s 9,500 breweries. The Brewers of Europe promotes the positive role played by beer and the brewing sector in Europe and advocates the creation of the right conditions to allow brewers to continue to freely, cost-effectively and responsibly brew and market beer across Europe. Follow us on Twitter and visit our website. BRUSSELS 25 October 2018. Members of the European Parliament have voted against the European Commission’s discriminatory proposals to over-tax flavoured, typically low-alcohol, beers. Whilst supporting the remainder of the Commission’s proposals for revisions to the EU’s Structures Directive (92/83/EEC), MEPs sensibly chose to adopt in Strasbourg amendments that reject the Commission’s proposal to distort competition through a tax system whereby, in any given country, flavoured beers and regular beers of the same alcohol content end up paying a different tax rate. The ‘Degrees Plato’ is the traditional means, still used in half of the EU member states as an alternative to ABV (alcohol by volume), to calculate beer excise duties on the basis of the concentration of fermentable sugars prior to fermentation. In May of this year, a landmark case brought before the European Court of Justice ruled that, since ingredients added after fermentation have zero impact on the alcohol content of the beer, they should also have zero impact on the degree Plato for excise purposes. The discussion now moves back to the Council, which must “have regard to” the opinion of the European Parliament. Brussels 29 August 2018. The Brewers of Europe warns that the latest European Commission proposal on the revised structures directive flouts EU law by contradicting the recent ruling of the European Court of Justice. The beer sector had expected that the Commission’s proposal would follow the Court’s decision on the Degrees Plato measurement system, used by half of the EU’s Member States for calculating beer excise duties. As the Council’s tax working groups resume their discussions next week on the European Commission’s “Proposal amending Directive 92/83/EEC on the harmonisation of the structures of excise duties on alcohol and alcoholic beverages”, The Brewers of Europe calls upon the Council, the European Parliament, the EESC and the European Commission to ensure that the revised Structures Directive is lawful and delivers on its objectives. By the European Commission making a proposal that "all the ingredients of the beer, including those added after fermentation, shall be taken into account for the purposes of measuring the degree Plato", it is no longer solely a tax on the alcohol. Under the Commission’s proposal and in contradiction with the CJEU judgment, these sugars would be considered for the measurement of the degree Plato and therefore the calculation of the excise due. The result is that a flavoured beer – even if produced by a brewery of the same size, in the same country – would be subject to a higher rate than a regular beer of the same alcohol content. This is discriminatory and completely contradictory to the harmonisation objectives of the Directives. The Brewers of Europe sent its latest letter to Europe’s Taxation Commissioner, Pierre Moscovici, expressing brewers’ dissatisfaction and disbelief at the Commission’s proposal to contradict the decision of the EU’s highest court (Case C-30/17). Bergeron added: “Our correspondence with the Taxation Commissioner shows that the sole justification found for the contentious proposals relates to the technical, practical and economic challenges of measuring and enforcing Plato legally and correctly. However, we are submitting evidence that shows these concerns are completely unfounded.” It is noteworthy that none of the countries already applying Plato in line with the CJEU ruling cited any concerns with measuring Plato correctly or carrying out compliance checks. Whilst The Brewers of Europe supports the majority of the Commission’s proposal, to ensure Better Regulation and respect of the Rule of Law, we call upon the Council and the European Parliament to reject this part of the proposal and invite the Commission to amend it to clarify that ingredients added after fermentation shall not be considered for the purposes of measuring the degree Plato. Degrees Plato is a scale for measuring the ratio of water to fermentable sugar in beer. It is used as an alternative to ABV – alcohol by volume – in half of EU Member States to calculate beer excise duties. In 2015 the brewing sector added €10.9bn in total excise duty for EU governments. Join the conversation using #BeerWisdom and #RightToKnow. Note to editors: Mr. Pavlos Photiades (born 1964) is Managing Director of Photos Photiades Breweries and Photos Photiades Group, the leading brewery and beverage production and distribution group of companies in Cyprus with subsidiaries in Greece, Romania, Slovenia and Croatia. Photos Photiades Group is also involved in Insurance and Real Estate Development. Mr. Photiades has served on the Board of Directors of several public companies in Cyprus and Greece and has been serving as a President of The Brewers of Europe since 2016. Mr. Photiades studied Economics at Harvard University where he graduated in 1988 having been awarded twice the Harvard Scholarship for academic achievement. He also holds an MBA from INSEAD. About us: Based in Brussels, The Brewers of Europe brings together national brewers’ associations from 29 European countries and provides a voice to support the united interests of Europe’s 8,500 breweries. The Brewers of Europe promotes the positive role played by beer and the brewing sector in Europe and advocates the creation of the right conditions to allow brewers to continue to freely, cost-effectively and responsibly brew and market beer across Europe. Follow us on Twitter, Facebook and visit our website www.brewersofeurope.org. Brussels, 17 May 2018. The Brewers of Europe welcomes today’s decision by the European Court of Justice clarifying the Degrees Plato calculation, a scale widely used to determine excise duty rates for beer. Given brewing’s renaissance in Europe and its importance as a jobs and growth provider, it’s critical that policy-makers ensure that beer tax regimes support the value chain. Latest figures show that the brewing sector adds €50bn annually to the EU economy and over €42bn in tax revenues for governments. Brewers also make a vital contribution to their local communities. Small and medium-sized brewers are major customers for farmers and suppliers in brewing regions. Of the 8,500 breweries operating today in Europe, 1,000 were launched in the past year alone. The European Commission has made it clear that revising the current legislation should help reduce administrative and compliance costs, improve the revenue collection in some areas, reduce fraud and facilitate legitimated trade, as well as ensuring a higher level of human health protection. The Brewers of Europe has advised that the Council Directive 92/83/EEC of 19 October 1992 establishes an appropriate legal framework for taxing alcoholic beverages based on a series of rules that recognise the specifics of individual products. The deceptively simple solution of taxing all alcoholic beverages on the percentage of alcohol by volume overlooks the varying structures of the different drinks sectors, the integral role played by beer in Europe's economy and the fact that beer is so much more than alcohol. We call for taxation to continue to be based on product categories and not solely on alcohol content regardless of the product. Note to editors: Degrees Plato is a scale for measuring the ratio of water to fermentable sugar. Brussels 14 March 2018. Alcoholic beverage sectors presented this week to the EU Health Commissioner a joint framework to voluntarily list ingredients and nutrition information, hereby opening a crucial phase: implementation by all sectors, not just the brewers. EU Commissioner for Health & Food Safety Vytenis Andriukaitis welcomed the fact that the sectors had respected the deadline set by the European Commission for submitting a joint self-regulatory framework on the provision of nutrition information and ingredients listing. The meeting was also an opportunity for the individual beer, cider, spirits and wine sectors to unveil both to the Commissioner and to each other, their individual annexes explaining how each sector would be moving forward with implementation. The Brewers of Europe had already presented the beer commitment to Commissioner Andriukaitis on 28 February, with the Commissioner stating: “I appreciate the rigour and ambition with which The Brewers of Europe and the beer sector have been committed to providing information to consumers. I can only encourage the brewers to continue the good work and to keep me informed on progress.” The Commissioner stated this week that the Commission would carefully analyse both the joint proposal and the individual sector annexes before taking a decision on whether the alcoholic drinks sectors had replied satisfactorily to the Commission’s request to “respond to consumers’ expectations and present within a year of adoption of this report a self-regulatory proposal that would cover the entire sector of alcoholic beverages”. Note to editors: Launched in the European Parliament in 2012, the European Beer Pledge is a voluntary initiative by brewers across Europe to support EU Member States under the European Union’s Alcohol and Health Forum. The Brewers of Europe, a founding member of the Forum, committed Europe’s brewers to taking concerted and measurable action under three areas of activity, with the first pillar being to increase consumer knowledge of beer and its responsible consumption. In March 2015, The Brewers of Europe announced in Brussels a major voluntary move from brewers across Europe to list ingredients and nutrition information, in line with the legal requirements for all non-alcoholic drinks, including non-alcoholic beer. Read more here. Brussels 12 March 2018. The Brewers of Europe today endorsed a joint framework with other alcoholic beverage sectors to voluntarily list ingredients and nutrition information and, through the Beer Annex to the framework, reiterated brewers’ long-standing commitment to transparency in this area, just as the European Commission, Parliament, Health Council, civil society groups and, most importantly, consumers expect. “The Brewers of Europe agreed with the key conclusions of the European Commission’s March 2017 alcohol labelling report, that there were no objective grounds that would justify the absence of ingredients and nutrition information for alcoholic beverages or a differentiated treatment for some alcoholic beverages”, said Pierre-Olivier Bergeron, Secretary General of The Brewers of Europe. “We welcome today’s step forward by the other alcoholic beverage sectors to join the Brewers in a common framework agreement to list ingredients and nutrition information. Europe’s brewing sector has played an instrumental role in pushing for a self-regulatory framework that removes the anomaly of the general exemption for alcoholic beverages from the obligation to list ingredients and energy values”, said Pierre-Olivier Bergeron, Secretary General of The Brewers of Europe. “I am pleased to see that the other alcoholic beverage sectors are now going to be joining the brewers on this journey. In full transparency we now expect our actions to be monitored and to all be judged on implementation”. The joint framework with other alcoholic beverage sectors can be downloaded here. The joint framework press release with other alcoholic beverage sectors can be downloaded here. The Beer Annex to the framework can be downloaded here. Launched in the European Parliament in 2012, the European Beer Pledge is a voluntary initiative by brewers across Europe to support EU Member States under the European Union’s Alcohol and Health Forum. The Brewers of Europe, a founding member of the Forum, committed Europe’s brewers to taking concerted and measurable action under three areas of activity, with the first pillar being to increase consumer knowledge of beer and its responsible consumption. In March 2015, The Brewers of Europe announced in Brussels a major voluntary move from brewers across Europe to list ingredients and nutrition information, in line with the legal requirements for all non-alcoholic drinks, including non-alcoholic beer. Read more here. About us: Based in Brussels, The Brewers of Europe brings together national brewers’ associations from 29 European countries and provides a voice to support the united interests of Europe’s 8,500 breweries. The Brewers of Europe promotes the positive role played by beer and the brewing sector in Europe and advocates the creation of the right conditions to allow brewers to continue to freely, cost-effectively and responsibly brew and market beer across Europe. Follow us on Twitter and visit our websites www.brewersofeurope.org and www.beerwisdom.eu. Brussels, 15 November 2017. The Brewers of Europe takes note of the UK Supreme Court ruling on minimum unit pricing and is keen to see a robust assessment of its impact on health harms in Scotland. “Whilst taking note of the judgment by the UK Supreme Court today, we will monitor the implementation and evaluation of the Scottish legislation and the extent to which the resulting market distortions would ultimately be justified by the introduction of minimum unit pricing, a measure introduced on the presumption that it would effectively reduce alcohol-related harm. About us: Based in Brussels, The Brewers of Europe brings together national brewers’ associations from 29 European countries and provides a voice to support the united interests of Europe’s 7,500+ breweries. The Brewers of Europe promotes the positive role played by beer and the brewing sector in Europe and advocates the creation of the right conditions to allow brewers to continue to freely, cost-effectively and responsibly brew and market beer across Europe. Follow us on Twitter and visit our website. In March 2015, The Brewers of Europe announced a major voluntary move from brewers across Europe to list ingredients and nutrition information on their brands per 100ml, in line with the legal requirements for all non-alcoholic drinks, including non-alcoholic beer. This landmark commitment builds on the European Beer Pledge, a voluntary initiative by brewers across Europe to support EU Member States in reducing alcohol related harm. The latest progress was announced today by Pierre-Olivier Bergeron, Secretary General of The Brewers of Europe, at a Eurocare event hosted by MEP Jytte Guteland in the European Parliament. Bergeron said, “with regards to ingredients, we are ahead of our target and now estimate that over 70% of pre-packed beer in the EU is labelling its ingredients”. He added, “around a third of pre-packed beer now labels calories”. Speaking to a packed room, the EU’s Health Commissioner Vytenis Andriukaitis, repeated the main conclusion from the Commission’s 2015 report on alcohol labelling that “the Commission has not identified objective grounds that would justify the absence of information on ingredients and nutrition information on alcoholic beverages or a differentiated treatment for some alcoholic beverages” and stated that now is the time to find solutions not just continue discussions. In March 2017, the European Commission gave alcohol producers until March 2018 to deliver a self-regulatory proposal that would respond to consumers’ expectations and cover the entire sector of alcoholic beverages. The Brewers of Europe will continue to work with other sectors following the Commission’s call to develop a voluntary solution. We encourage other sectors to follow our lead whilst simultaneously continuing to deliver against our own commitment, as it is clear that consumers can only be empowered to take informed decisions on how different foods and beverages fit within their diet and lifestyle if there is a level playing field of comparable information. Brussels, 9 June 2017 – Representatives of the brewing sector from across Europe are in Helsinki today for the General Assembly of The Brewers of Europe. Top of the agenda: how to sustain the boom of recent years so beer can continue to serve Europe well. Beer is a vital European business, generating 2.3 million jobs from grain to glass, €50 billion in value-added and contributing €42 billion to government revenues. It is also a growth business as appreciation for beer is on the increase within the EU and beyond. More than 3,000 new breweries have been established in Europe so far this decade. In particular, the number of small breweries is rising, and so is the diversity of beers. Policy must encourage, not undermine this dynamic sector and preserve a uniquely European tradition of hospitality. “We actively support initiatives that are effective in promoting responsible beer consumption. But experience has shown that restrictive control policies simplistically aimed at reducing per capita consumption miss the target problem, producing mixed results and unintended consequences from both an economic and public health perspective,” continued Pierre-Olivier Bergeron. “In some cases, those who are inconvenienced tend to be moderate drinkers for whom beer or other drinks may be part of a balanced and healthy lifestyle, while the determined alcohol drinker will always find a way." Also, though at 3.5%, Finland enjoys one of the lowest rates for underage beer drinking, having seen a drop of 53% from 2008-20161, just better than the EU average of 47%, there is more to be done. The “Danish model” offers a promising basis for emulation. Bryggeriforeningen, the Danish Brewers’ Association, spearheaded the establishment of an “Alcohol Partnership” supported by the Danish Ministry of Health as a contribution to reducing harmful alcohol consumption and to postponing when young people start to drink. Their 2015-2016 campaign successfully reduced the percentage of minors who buy alcohol illegally in stores. These achievements need to be replicated, not undermined. Based in Brussels, The Brewers of Europe brings together national brewers’ associations from 29 European countries and provides a voice to support the united interests of Europe’s 7500+ breweries. The Brewers of Europe promotes the positive role played by beer and the brewing sector in Europe and advocates the creation of the right conditions to allow brewers to continue to freely, cost-effectively and responsibly brew and market beer across Europe. 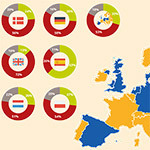 When almost nine out of ten European consumers call for the list of ingredients and nutritional values of alcoholic drinks to be provided, as revealed by the 2016 GfK survey of 9000 adults in nine EU countries, there is an onus on all concerned economic operators to take such clear expectations seriously and to meet them diligently. This is why since 2015 Europe’s brewers have been voluntarily rolling out ingredients listing and nutrition information across Europe, following the rules that apply to non-alcoholic drinks. Today I can proudly confirm that by the end of this year, over 60 per cent of new beer volumes hitting shelves across Europe will carry this information, on labels and also via online platforms, meeting the needs of today’s consumers. In this context, The Brewers of Europe welcomes the European Commission’s 13 March 2017 report- that recognises the leading role taken by the brewing sector - and the clear statement that there is no objective justification for the absence of ingredients and nutrition information on alcoholic beverages or a differentiated treatment for some alcoholic beverages. It is a common feature of human nature that boldness encounters objections and standing out from the crowd exposes you to criticism. The Brewers of Europe has been challenged on the accuracy of respecting EU law (! ), in particular about our use of the legally established reference measure of 100 ml for providing nutrition values. This has been applied to all beverages across Europe for decades and is very well understood by consumers as a means of comparing drinks on a like-for-like basis. To note that portion information can also be provided in addition. Critics also argue that smaller operators will be disadvantaged due to the extra analysis costs involved, despite assurances that average values are permitted and the fact that modern technologies can overcome many hindrances at a reasonable cost if any. We are now encouraged to sit down together with other sectors following Commission’s call to develop a voluntary solution that applies to all alcoholic beverages. We are encouraging fellow colleagues to follow our lead as it is clear that consumers can only be empowered to take informed decisions on how different foods and beverages fit within their diet and lifestyle if there is a legal and level playing field of comparable information. Pierre-Olivier Bergeron is the Secretary General of The Brewers of Europe, which brings together national brewers’ associations from 29 European countries and provides a voice to support the united interests of Europe’s 7,500+ breweries. The Brewers of Europe promotes the positive role played by beer and the brewing sector in Europe and advocates the creation of the right conditions to allow brewers to continue to freely, cost-effectively and responsibly brew and market beer across Europe. Brussels, 13 March 2017 - The Brewers of Europe welcomes the European Commission’s call today for alcoholic drinks to list ingredients and nutrition information, matching the requirement for non-alcoholic beverages that came into force in December 2016. EU rules oblige producers of beverages below 1.2% ABV to list ingredients and provide the seven nutritional values per 100ml. The EU Regulation also requires companies voluntarily providing ingredients and calorie information for alcoholic beverages above 1.2% ABV to do so per 100ml. Following a public commitment made by The Brewers of Europe in March 2015, Europe’s brewers have been voluntarily rolling out ingredients listing and nutrition information across Europe, following the rules that apply to non-alcoholic drinks. We expect that by the end of 2017, over 60% of new beer volumes hitting the shelves across Europe will carry this information, on labels and also via online platforms, meeting the expectations and needs of today’s consumers. We also encourage other sectors to follow our lead in providing both ingredients and nutrition values according to the rules, as it is clear that consumers can only be empowered to take informed decisions on how different foods and beverages fit within their diet and lifestyle if there is a level playing field of comparable information. The Commission states that it will report back in one year on how alcoholic drinks producers are progressing with the voluntary roll-out of ingredients and nutrition information. This roll-out must be done against the rules as laid down in the EU Regulation. The Brewers of Europe is confident that the head start that we have given ourselves in doing this will stand us in good stead in this timeframe. Based in Brussels, The Brewers of Europe brings together national brewers’ associations from 29 European countries and provides a voice to support the united interests of Europe’s 7,500+ breweries. The Brewers of Europe promotes the positive role played by beer and the brewing sector in Europe and advocates the creation of the right conditions to allow brewers to continue to freely, cost-effectively and responsibly brew and market beer across Europe. It is with great sadness that The Brewers of Europe has to today announce the passing of our former President Alberto da Ponte, who died this Saturday aged 64 years. Alberto not only served as President but was a lifelong friend and supporter of Europe’s brewing community, also after he left the beer sector in 2012. Mr. da Ponte, CEO of Central de Cervejas in Portugal from 2004 to 2012, was elected President of The Brewers of Europe in May 2008, with his first official duty being to open, in Brussels that same evening, the 50th anniversary gala reception of The Brewers of Europe, sharing a memorable toast with the EU Commissioner for Enterprise and Industry, a Portuguese and a German showing in one ‘sip’ the diversity of Europe’s beer cultures and beer’s gift to bring people together. Whilst in particular Mr da Ponte’s first mandate (2008-2010) coincided with a very difficult period for Europe’s brewing sector, as the economic crisis bit and Europe’s beer market declined, his leadership was essential in uniting the thousands of brewers around a clear strategic vision and mission for The Brewers of Europe, with the association’s membership also expanding to bring in new countries. An important feature of the two mandates of Mr da Ponte was the growing focus on the importance of communicating and enhancing beer’s reputation towards a wider range of stakeholders. It is in no small measure thanks to Mr da Ponte’s hands-on support that the annual Beer Serves Europe event, after welcoming President of the European Council at its first edition in 2011, also welcomed the President of the European Commission the following year, to celebrate the contribution of beer and brewers to the EU’s own priorities. Ensuring The Brewers of Europe be sustainably structured was one of Mr da Ponte’s priorities over the four years he served and, having raised the profile of both beer and the association, Mr da Ponte was able to leave the association in rude health in 2012 to capitalise on the first shoots of recovery in the beer market. As the General Assembly of The Brewers of Europe recorded in November 2012, the legacy Mr da Ponte was leaving behind was extensive, with organisation, communication, enthusiasm and dedication featuring throughout. Alberto leaves behind a loving wife, whom we also came to know well. We share our condolences not just with the European and Portuguese beer community, but also with Fátima. It is with a heavy heart that we mourn Alberto’s death but will also have many beautiful memories to cherish of a hard-working, dedicated, thoughtful and great friend. It has rarely been more appropriate to raise a glass of beer in tribute. Rest in Peace Alberto. Brussels, 30 November 2016 - At their sixth annual Beer Serves Europe event this evening, The Brewers of Europe will be emphasising how their 7,500 breweries not only underpin economic growth in Europe but also make a significant contribution to trade with the rest of the world. Two new publications, the 180-country study Beer Connects Europe with the World and the 2016 edition of Beer Statistics, highlight how beer is accompanying Europe’s economic recovery and flowing increasingly towards fast growing areas of the globe. Total consumer spending on beer was over €110 billion in the EU in 2014, an indication that a recovery from the 2008 crisis was in place. The latest statistics confirm that the European brewing sector is now firmly on the path to prosperity. Consumption and production are not just stable, but improving with year-on-year rises in European Union countries from 2014 to 2015 of 1% in consumption and 1.4% in production. Meanwhile beer is growing at the fastest rate among the top 10 food and drinks products in the EU by export value. Next year, at current rates of growth, beer will be up from 10th place to 6th place. “The Brewers of Europe are proud of the major part they play in the European economy, generating considerable employment and boosting trade both within the EU and beyond. Supportive policies will enable brewers to continue contributing to the overall competitiveness of the European economy and sustained growth,” said Pavlos Photiades, President of The Brewers of Europe. The European brewing sector is a key actor for job creation and the economy and is playing its part in supporting the delivery of the Europe 2020 Growth Strategy. Beer adds the equivalent of the GDP of Luxembourg, or around €51bn, annually to EU output and over €11bn in excise revenues for governments. The sector provides over 120,000 direct jobs in the EU alone, but nearly 95% of beer-generated employment occurs outside the brewing companies themselves: every one of these jobs is the catalyst for further jobs across the entire value chain, creating over 17 jobs in the wider economy, making a total of 2.3 million. In addition to continued investment by Europe’s brewers in establishing European beer brands around the world, in 2015 European beer exports rose to 82 million hectolitres, an increase of 7% year-on-year. In 2008, exports beyond the EU accounted for 16% of the total. In 2015 the proportion has more than doubled to 35%. A sure sign of confidence and trust in the sector is the continuous rise in new breweries opening across the EU since 2008 and the total has almost doubled since 2010. There were 588 new microbreweries established in the year from 2014 to 2015, a rise of 13%. The trend attests to the high level of consumer interest in the diversity and variety of Europe’s many different beer cultures. Beer is also unique amongst the main alcoholic beverage categories for its range of alcoholic strengths. Within the rich spectrum of choice the sector offers consumers, the market for non-alcoholic and low alcohol beers has doubled from 2000 to 2015. Beers below 3% ABV now represent around 6% of the overall European beer market, reaching 14% in some countries. They are proving ideal for occasions where people wish to a have a great tasting drink but either cannot, or do not wish to, consume more or any alcohol, for example before driving or when pregnant. According to the European Commission, beer is affirming its place among Europe’s top export products, with double digit growth (+18%) in beer exports from 2014 to 2015. The top destinations are US, China, Canada, but over the past 20 years EU brewers have extended trade to 123 countries around the world. EU brewers are also among the top three import partners of 97 countries outside the EU. Average annual growth over 20 years of 8% has tripled the annual quantity of beer traded globally and these flows can only increase: the European Commission predicts that 90% of economic growth in the future will occur outside the EU. The global beer network can be a good indicator of the openness of countries in facilitating knowledge, people and investment flows. European brewers are powerful world players leading the way in investing into emerging markets, contributing to growth and prosperity for both Europe and the world. However, beer trading is more than economic exchange: it is an exchange of culture and prestige and a force for sustainable development in emerging countries. By setting up production locally, contract farming schemes and investments by the brewing sector generate a high level of employment, improve supply chain management and raise grain productivity – while enforcing solid standards and human rights. The success of the EU brewing sector relies on the EU connecting its internal market to the rest of the world. Brewers are also often well placed to lead the charge for fairness in trade agreements, calling for equivalent treatment of products and pushing for elimination of the type of tax discrimination that particularly affects small businesses. The study Beer Connects Europe with the World was commissioned by The Brewers of Europe and conducted by the independent international engineering and project management consultancy Royal HaskoningDHV. The 2016 edition of Beer Statistics was compiled from data collated by national brewers’ associations through surveys carried out by The Brewers of Europe and Eurostat. Brussels, 26 September 2016 - In 2016 many beer brands started the process of updating their labels and online information platforms and, by the end of 2017, over half of the beer brewed in the EU will carry ingredients and nutrition information. This follows the March 2015 commitment by The Brewers of Europe to voluntarily go beyond current EU legislative requirements for such declarations, which exempt alcoholic beverages of more tha n 1.2% ABV (alcohol by volume). This transparency initiative is designed to present the facts to an increasingly eager audience: according to consumer research(1), 86% of Europeans think drinks producers should provide both the ingredients and the nutrition information. It is a central part of the overall consumer information drive in the European Beer Pledge that aims to promote responsible beer consumption as part of a balanced lifestyle. The Brewers of Europe are determined to help their customers make informed drinking choices and their choice to be ahead of the curve in providing information is also well informed: pan-European consumer research shows that a vast and growing majority of European consumers believe they should have access to the same nutrition information per 100ml for alcoholic beverages as are available for any other food and drink product. GfK’s report also highlights that, though levels of interest in the ingredients and energy value vary from country to country, consumers widely welcome the possibilityof accessing the information online as well as offline. Beyond tailoring communication campaigns to suit country-specific audiences, Europe’s brewers have also launched an online quiz at beerwisdom.eu to inform and entertain drinkers across the region. Based in Brussels, The Brewers of Europe brings together national brewers’ associations from 29 European countries and provides a voice to support the united interests of Europe’s 6500+ breweries. The Brewers of Europe promotes the positive role played by beer and the brewing sector in Europe and advocates the creation of the right conditions to allow brewers to continue to freely, cost-effectively and responsibly brew and market beer across Europe. Brussels, 16 September 2016 - As part of the second Global Beer Responsibility Day, The Brewers of Europe, the home of over 6,500 brewers in Europe, has launched a new digital campaign to support responsible beer consumption – #BeerWisdom www.beerwisdom.eu and released the latest reporting on the roll-out of the European Beer Pledge. The reporting shows how Europe’s brewers are fulfilling their commitment to partner with governments and civil society across the region and use events, media campaigns, server training and digital tools in initiatives to promote responsible consumption. In addition the sector continues to provide consumers with the facts they need to make more informed drinking choices. As in previous years, the reporting is now undergoing a thorough assurance process carried out by KPMG Sustainability. “Whilst all brewers want people to enjoy their brew, alcohol misuse is in no one’s interest. All in the brewing sector take their responsibility to help increase consumer knowledge, support responsible consumption and address alcohol-related harm seriously. We are determined to pursue these important efforts into the future and look forward to working with EU decision-makers, stakeholders, and our partners, explained Pierre-Olivier Bergeron, Secretary-General of the Brewers of Europe. Global Beer Responsibility Day was initiated in 2015. This year’s edition builds on the momentum gained in year one, bringing together partners in 76 countries around the world. “Whilst our work with NGOs and government partners goes on all year round, Global Beer Responsibility Day provides brewers across the world with an opportunity to rally their joint efforts, assessing and building upon the significant progress we are making in supporting responsible beer consumption and the fight against alcohol misuse,” said Simon Spillane, Chair of the Worldwide Brewing Alliance. The data released today contains details of initiatives that have been rolled out in partnership with governments, doctors’ groups, road safety authorities, parents, educators, the police, non-governmental organisations and consumer groups throughout Europe. There is increasing evidence that the range of actions from “Sport is the better way for children to grow up” campaigns to those promoting non-alcoholic beer as a positive alternative for drivers have played their part in decreasing trends in alcohol misuse. Weekly beer drinking among 15-year-olds in the EU decreased by 45% for boys and by 52% for girls from 2008 to 2016 according to the WHO Europe coordinated study on Health Behaviour in School-aged Children (HBSC study), while drunkenness is down 27%. Our partners in tackling drink driving, the The European Transport Safety Council report there were 20,580 fewer road deaths in the EU in 2011-2015 (than if the number had remained constant after 2010). In statistics monitored by the Deutschen Brauer-Bund, downward trends in Germany continue: per capita alcohol consumption has decreased from 11.1 litres pure alcohol in 1995 to 9.5 litres in 2014 and the percentage of 12- to 17-year-olds consuming alcohol at least once a week has dropped from 17.9% in 2001 to only 11.8% percent in 2014. Meanwhile the percentage of accidents related to alcohol has more than halved since 1995 to around 1.5% in 2013 and that in cases of violent crime under the influence of alcohol from 32.1% in 2012 to 30.6% in 2013. In March 2015, The Brewers of Europe committed to voluntarily going beyond current EU legislative requirements and progressively roll out ingredient listing and nutrition information for beers sold on the European beer market. Concretely this means that over 50% of beers sold on the EU market will carry ingredients and nutrition information by end 2017. Meanwhile, brewers are pursuing efforts both online and offline towards further increasing consumer knowledge of beer. The Beer Pledge integrated from the outset standards to guarantee responsible marketing and advertising. These help brewers and brewers’ associations to ensure that self-regulatory mechanisms remain current as digital and social media play an increasingly significant role. The Brewers of Europe are also an associated partner of the Responsible Marketing Pact, to be launched later in 2016 by the World Federation of Advertisers. Global Beer Responsibility Day is an annual industry-wide initiative that brings together brewing companies, big and small, and beer associations, to highlight and reinforce the responsibility efforts conducted and supported by brewers in partnership with wholesalers, retailers, government and law enforcement officials, NGOs and others. Established in 2015 on the initiative of Anheuser-Busch InBev, Carlsberg and HEINEKEN, Global Beer Responsibility Day is an occasion for brewers, together with many local partners and stakeholders, to launch and showcase a variety of both new and ongoing programs aimed at reducing the harmful use of alcohol, including drink driving and underage drinking. The initiatives include server and seller training, ID-checking programs and consumer education efforts, among others. Brussels, 3 June 2016 - The General Assembly of The Brewers of Europe today elected Pavlos Photiades, Managing Director of Photos Photiades Breweries, as its new President, succeeding Demetrio Carceller. Speaking after his election, Pavlos Photiades said: “I am honoured to be tasked with leading The Brewers of Europe taking the opportunity to build on the progress achieved under the tenure of Demetrio Canceller. I am committed to ensuring that Europe’s brewing sector, with its unique mix of breweries of all sizes pursues its dynamic participation in Europe’s heritage”. “Europe’s brewing world is changing fast with the combined trends of consolidation and the blossoming of small and medium-sized breweries. I will seek to it that The Brewers of Europe capitalises on these changes as well as the successful programmes that deserve being further deployed“, Photiades explained. Beer in Europe generates an estimated 2.3 million jobs throughout the value chain, from grain to glass, with 1 job in a brewery generating on average a further 17 in supply, agriculture, bars and restaurants of Europe. Total consumer spending on beer was over €110 billion in EU in 2014. Exports now make up around 20% of European beer production. With over 900 new breweries opening in the last two years, Europe’s brewing landscape now counts over 6.500 breweries, stretching to all corners of Europe. “Two years ago we had just started the execution of the Positive Story of Beer, translating in many countries into the Love Beer campaign. Today, beer is back in people’s minds”, said Demetrio Carceller. “I am proud of what we have been able to achieve. The Brewers of Europe ranked last year second as the best perceived European trade association in the field of consumer goods. Our commitment to equipping Europe’s consumers with ingredient and nutrition information has also helped to achieve this score. And I am very pleased that Pavlos Photiades will take over as president. With his skills as a captain of industry and his passion for beer he will no doubt take The Brewers of Europe to the next level”, concluded Carceller. Mr. Photiades (born 1965) is Managing Director of Photos Photiades Breweries, the leading brewery and beverage distribution company in Cyprus with subsidiaries in Greece, Romania, Slovenia and Croatia. Photos Photiades Group is also involved in Insurance and Real Estate Development. He has served on the Board of Directors of several public companies in Cyprus and Greece and has been serving a second term on the Board of Directors of The Brewers of Europe as Vice-President since 2015. Mr. Photiades studied Economics at Harvard University where he graduated in 1988 having been awarded twice the Harvard Scholarship for academic achievement. He also holds an MBA from INSEAD. Total consumer spending on beer was over €110 billion in the EU in 2014 – roughly €200 per inhabitant. From grain to glass, beer generates an estimated 2.3 million jobs in Europe throughout the value chain. Every 1 job in a brewery generates a further 17 jobs on average - around 1% of total EU employment: 2 in supply and agriculture, 2 in retail and 13 jobs in the bars, pubs, cafés and restaurants offering beer. Founded in 1958 and based in Brussels, The Brewers of Europe unites the national brewers’ associations from 29 European countries. The below piece by Pierre-Olivier Bergeron, Secretary General of The Brewers of Europe, was published on 5 November 2015 on Euractiv.com. Pierre-Olivier Bergeron is Secretary General of The Brewers of Europe. Today, The Brewers of Europe has filed its voluntary commitment on Consumer Information to the EU Alcohol and Health Forum. It is designed to increase consumers’ knowledge of beer ingredients and nutritional values and is the 112th commitment we have filed to date. This was originally planned to coincide with the Forum’s biannual plenary meeting today, which has been postponed by the European Commission. The Forum was set up in 2007 in response to the EU Alcohol Strategy, as ‘a common platform for all interested stakeholders at EU level that pledge to step up actions relevant to reducing alcohol-related harm’. The Brewers have long been initiating responsibility commitments. We believe it is important that we continue to review the Forum’s commitments and share and learn from each other’s best practices. There is clear evidence across Europe that alcohol-related harm is coming down in EU countries in high profile areas such as underage drinking, excessive consumption and drink driving. Indeed drink driving fatalities have been more than halved in the last ten years in the EU. There is still a lot to do and Europe’s brewers are playing a part in it. But we know the 2006 EU Strategy has had a positive impact. While the European Commission is still deliberating on the added value that the EU can bring in terms of supporting Member States to tackle alcohol-related harm, I can assure you that The Brewers of Europe and its members remain committed to action, to working together with governments and civil society in promoting responsible beer consumption. A key element of that approach is this year’s commitment from Europe’s brewers to voluntarily list ingredients and nutrition information, thus enabling consumers to make informed choices. It is part of our EU Beer Pledge which aims at increasing consumer knowledge of beer. It also voluntarily enacts the Food Information to Consumers Regulation to provide nutritional values, despite there being no current legislative requirement for this at EU level for alcoholic beverages above 1.2% ABV. Today’s filing is the logical follow up to our first announcement of the commitment inMarch earlier this year, when it was welcomed by the European Commission, MEPs, consumer groups and public health NGOs. For us this was a landmark moment and it is a very clear example of where stakeholders and partners across society agree that our voluntary actions can make a difference. We will report annually on our Commitment against indicators in terms of inputs, outputs and impact. The Brewers of Europe is standing ready to support the Commission in its work to demonstrate the value already delivered by the EU Alcohol Strategy and multi-stakeholder action. The Brewers of Europe today published the 2015 edition of its Beer Statistics, which looks at the key figures from 2014 and trends since 2009 across the 28 EU Member States. “The 2015 figures are very promising and once again highlight how beer and its value chain are on the road to recovery following the 2008/09 economic crisis,” said Pierre-Olivier Bergeron, Secretary-General of The Brewers of Europe. The beer sector also remains a key actor in boosting job creation, a key pillar in the Europe 2020 Growth Strategy, and spurred on by an increase in exports which in 2014 rose to 8 billion litres. There are now 6,500+ active breweries in the EU - double the number in 2008 - with around 650 more openings in 2014 alone, representing an 11% increase from 2013. It should however be emphasised that the success of the beer sector is still largely dependent on supportive policies to enable brewers to compete both with each other and across borders, with the need for a sustainable and supportive taxation regime for beer, a common call from brewers across the continent. Brewers are also more than happy to play their part in promoting responsible beer consumption, and in March this year, The Brewers of Europe launched a voluntary initiative from brewers across Europe to list ingredients and nutrition information for their brands, effectively implementing a scheme that is already legally required for non-alcoholic drinks. This shows brewers going beyond existing EU legislation to ensure that consumers receive all the necessary facts to make informed choices about the beers they purchase and consume. Click here to download the Beer Statistics 2015 Edition. In the last decade significant progress has been made in reducing the number of deaths from drink driving. At the beginning of the century there were an estimated 12,500 alcohol-attributable deaths in road traffic in the EU but since then this number has decreased on average by around 5.7% each year(1). Despite these positive figures, alcohol remains a major risk factor on the roads. Drink driving is still one of biggest causes of death on Europe’s roads. Taking just one year, the European Transport Safety Council estimated that as many as 6,500 deaths could have been prevented if all drivers had obeyed the laws on drink driving(2). At The Brewers of Europe, we are taking pioneering steps through our partnership approach to ensure a sustained decrease of alcohol attributable deaths. We believe that cooperation is needed across the range of public and private stakeholders, including the road safety community, police, NGOs, regulators, the drinks industry and others. Joint efforts must continue to ensure continuous and sustained decreases in drink driving fatalities and to help the EU achieve its target of halving the overall number of road deaths from 2011 to 2020. Over the last two years The Brewers of Europe has been engaged in a partnership with the EU-wide NGO European Transport and Safety Council (ETSC), which involves The Brewers providing support and funding to the ETSC’s SMART project (Sober Mobility across Road Transport). The objective of SMART, which is one of the commitments filed under the European Alcohol and Health Forum, is to address the main issues related to alcohol and driving and to support the ETSC’s advocacy activities both at EU and Member State level to tackle drink driving. It delivers guidelines, best practices, dialogue at national level and engages interested stakeholders, including through high-profile EU and national events. It builds on decades of awareness raising on drink driving by Europe’s brewers through our partnerships at local, national and EU level. Since its inception, SMART events have already taken place in Brussels and around Europe including Rome, Madrid, Prague, and more recently this week’s event in London. An effective approach to reducing drink driving requires the correct combination of legislation, enforcement, sanctions, rehabilitation, technology, education and societal engagement. All events have thus involved experts including MEPs, the European Commission, national Ministries, law enforcement bodies, and members of The Brewers of Europe. A number of concrete case studies have emerged in the framework of the partnership including the following two examples. The first, from Sweden, involved drivers being automatically tested for alcohol at the port of Gothenburg when driving off the ferry, using a so-called “alco-gate”(3). Each driver has to blow into a breathalyser before starting their journey. If found to be over the limit, they cannot continue. On average 1 out of every 2,150 truck drivers was found to be driving under the influence of alcohol and 1 out of every 327 drivers of passenger cars. The initiative was widely supported by the drivers tested (86%) and will be rolled out more widely in Sweden. A second project involves installing alcohol interlocks on each Arriva bus in Denmark. If drivers are found to be over the limit, they cannot start the engine. As a result of this project, in the last five years there has been no record of any collision involving bus drivers under the influence of alcohol. The current three-year SMART programme runs until end 2016 at which time key insights and learnings will be reported upon. The Brewers will continue to work with the ETSC and all other stakeholders in the meantime to come up with new and innovative ways of reducing drink driving, thereby further lowering the number of casualties on Europe’s roads. Founded in 1958 and based in Brussels, The Brewers of Europe unites the national brewers’ associations from 29 European countries to promote the interests of over 5000 European breweries. With Global Beer Responsibility Day on 18th September, there is no better time to reflect on the many positive initiatives which The Brewers of Europe, representing the interests of over 5000 brewers in 29 European countries, are carrying out to promote responsible drinking across the continent. Evidence shows that brewers’ actions are contributing factors to decreasing trends in alcohol misuse. Find out more by watching our video which summarises some of the actions and progress made across Europe. But first, a word about Global Beer Responsibility Day: this is an initiative enacted by brewers across the world to recognise responsibility programs and promote responsible beer consumption. On this day, brewers, along with retailers, NGOs, enforcement officials, and other partners, will join together to bring the message of responsible drinking to communities in a variety of impactful ways. Brewers’ partnerships include, but are not limited to, drink driving and underage consumption prevention initiatives, bartender and server trainings, and consumer education tools. Moreover, many of these are continuous activities, and we take the time to assess and amend them according to whether their objectives have been met. For a full list of the many thousands of initiatives from brewers around the world see the Worldwide Brewing Alliance’s website. In the UK, we are seeing a change in mindset among adolescents. In 2014, 38% of 11 to 15 year olds reported having had an alcoholic drink, compared to 59% in 2000. In addition, the rates of men and women binge drinking fell respectively by 25% and by 20% in the period 2005-2013,. Between 2011 and 2013 the Netherlands saw a 20% decrease in alcohol consumption in minors, whilst the number of drink drive offenders halved between 2002 and 2013. High-risk drinking in Denmark decreased in all age groups from 2010 to 2013. Notably, the number of young men aged 16-24 who drink at least 30 drinks per week decreased by 45%, whilst their female counterparts experienced a 20% reduction. Finally, since 2006, when the EU’s Alcohol Strategy to support EU Member States in reducing alcohol-related harm was adopted, there has been a 45% reduction in drink drive fatalities across the EU. Tackling drink driving effectively involves a multitude of stakeholders including law enforcement, educators, retailers, and vehicle manufacturers, amongst others, and the progress shown here is largely a result of successful collaboration across disciplines. The downward trend on drink driving statistics is a fine example of how the brewing sector has for nearly a decade worked both internally and with our partners to bring about success. This is very much how we want to move ahead in the future and gives a clear roadmap for success in other areas such as underage drinking and tackling alcohol during pregnancy. We see continuous engagement as a means to bring about continuous improvement. Brewers are also active in supporting consumers to achieve balanced & healthy lifestyles, specifically through the provision of enhanced consumer information. In March 2015 The Brewers of Europe committed to voluntarily go beyond current EU legislative requirements and progressively roll out ingredients’ listing and nutrition information for beers sold on the European beer market. This is because we believe that consumers have the right to know the ingredients and nutrition information of the food and drinks products available to them on the European market. The roll-out of this commitment builds on the experience of fifteen EU countries where brewers are already labelling ingredients, and three EU countries where brewers have already begun to provide nutrition information. The commitment was welcomed by the European Commission, MEPs, the European consumers’ organisation (BEUC), the European beer consumers union (EBCU), and the European alcohol policy alliance (Eurocare). The Brewers are also developing an online interactive “calorie counter”, which will enable consumers to compare different alcoholic beverages on a level playing field. The Brewers of Europe are furthermore keen to support balanced information platforms such as www.beerandhealth.eu to tackle misconceptions around beer, and stress the importance of consuming beer responsibly, in moderation and as part of a balanced lifestyle. Finally, brewers are leading voices in the EU Alcohol and Health Forum for which we are responsible for one third of the 325 commitments to action. We hope the Forum can reconvene at the earliest opportunity so that we, together with our partners, can continue to tackle the critical issue of alcohol misuse. Brewers remain committed to the Forum and are rolling out, through our European Beer Pledge, actions which involve partnerships with government authorities and NGOs that concretely address alcohol-related harm at the local level. The Pledge was launched in the European Parliament in 2012 and focuses on consumer information, marketing self-regulation and campaigns against drink-driving, underage drinking, alcohol in pregnancy, and binge drinking. Global Beer Responsibility Day may only take place one day a year, but brewers are involved all year round in initiatives that are moving the needle when it comes to levels of alcohol-related harm across Europe. There is much that remains to be done, but we are determined to continue our hard work into the future and look forward to working with EU decision-makers, stakeholders, and our partners. Any stakeholder, industry, supplier, value chain partner, Member States, NGOs interested in the PEF pilot on beer. If you have not done so, create an ECAS account in order to access the Environmental Footprint wikipages: click here and read the guidance for registration (Please note that a delay of one to two days may be expected in order to allow your registration if you are not already signed up to the wikipage). PEF supporting study will be launched on the basis of the draft PEFCRs which will have taken account of received comments in the public virtual consultation phase. The studies will assess whether the draft PEFCR can be turned into a final PEFCR. Brussels, 1 September 2015 – The Brewers of Europe is strengthening its communication activities with the appointment of Jan de Grave as Communications Director. Since 2003, Jan de Grave was consecutively Vice President Corporate Communications and Vice President Sustainability at Telenet NV. Also, The Brewers of Europe has promoted Simon Spillane as Public Affairs Director. Simon Spillane joined The Brewers of Europe a decade ago and, since 2011 served as Senior Advisor – Beer & Society and Communications. Simon Spillane will be assisted by Mathieu Schneider, who joined The Brewers of Europe in 2009 as Project Coordinator, now serving as Public Affairs Manager. Strasbourg, 9 July 2015 – The Brewers of Europe and Brasseurs de France welcomed Members of the European Parliament to the METEOR brewery just outside Strasbourg yesterday. Seizing the opportunity of a rare moment between votes, a cross-party delegation of MEPs from 10 countries came to see the brewing process first-hand and better understand the craftsmanship and innovation that goes into brewing Europe’s favourite drink. The visit allowed MEPs from across the political spectrum a rare opportunity to get up close to the policy issues most affecting Europe’s brewers. Currently in the EU we brew around 38 billion litres of beer each year, with around 100 different beer styles and an estimated 40 thousand different brands on the market. Contributing over €50 billion each year to GDP and also generating over €50 billion in tax revenues for EU governments, beer also makes a large contribution to the European growth agenda. In times of high unemployment, it is also important to recall that beer alone secures 2 million jobs in the EU, from the farmers cultivating the cereals and hops to the bar staff serving the beers. Beer is also a key part of European heritage, with the beer culture a key factor in many tourist visits to Europe. Founded in 1640, METEOR brews 9 different beers, employs close to 200 people and has an annual turnover of €40 million. As brewers depend on supportive legislation to ensure a competitive European beer sector, this visit was a key opportunity for MEPs to understand the impact policies can have at the local level. The European Parliament Beer Club was established in 1995 and is a cross-party, transnational forum for exchange amongst MEPs about issues affecting the brewing sector. The EP Beer Club membership currently counts over 90 MEPs and it is hoped that such activities can help to grow the cross-party membership even further. With beer brewed in every single EU Member State, the Club also has an ambition to include MEPs from across the whole of Europe. Established in 1995, the European Parliament Beer Club is a forum for discussion and information exchange about issues that affect the brewing sector within the European Union. More at www.epbeerclub.eu. Founded in 1958, The Brewers of Europe unites the national brewers’ associations from 29 European countries to promote the unique contribution made by beer and brewers to Europe’s culture, economy and society. The Brewers of Europe also does the secretariat for the EP Beer Club. More at www.brewersofeurope.eu. Founded in 1880, Brasseurs de France, with 130 members, represents over 90% of the beer brewed in France. It defends the common interests of French brewers and collectively promotes the French brewing sector. More at www.brasseurs-de-france.com. Brussels, 1 July 2015: The Brewers of Europe is proud to feature prominently in Food Drink Europe’s ‘Balanced Diets and Healthy Lifestyles’ report, which catalogues initiatives put in place by the food and drinks industry to promote and encourage consumers to adopt balanced diets and live healthy lifestyles.. Released today at the World Expo in Milan, as part of EU Food and Drink Week, this new multi-stakeholder report features, amongst other brewer-led initiatives on marketing self-regulation and social responsibility, the recent commitment by Europe’s beer sector to provide nutrition and ingredients information to consumers. Currently EU legislation exempts producers of alcoholic beverages over 1.2% ABV from the legal obligation to provide nutrition and ingredients information. Featuring alongside commitments by other food and drinks’ sectors, it is clear that ensuring well-informed consumers is now a key priority for Europe. The commitment has received support from, among others, BEUC (the European Consumers Organisation), Eurocare and the EU Health Commissioner Vytenis Andriukaitis, following the Brewers’ announcement in Brussels and its subsequent presentation at the World Expo in Milan on the occasion of European Beer Day. European Beer Day included a programme of three panel discussions at the World Expo in Milan, involving speakers from Europe’s breweries, EU policy-makers and academic experts in the fields of nutrition, trade and innovation. In addition to discussing the place for beer in a healthy lifestyle, panelists debated the role for beer in job creation and growth, championing the importance of nurturing innovation for the beer sector. For more information about European Beer Day, please follow this link. The Brewers of Europe is delighted to announce European Beer Day, taking place this Friday 19 June at the World Expo in Milan. Taking the theme ‘Working for growth: what role for beer and brewers?’ a diverse line-up of high-level speakers will debate the ways to incentivise the growth potential of the brewing industry in Europe. Speakers include a number of Europe’s best known brewers, EU decision-makers and academic experts in the fields of nutrition, trade and innovation. Europe’s beer sector, consisting now of well over 5,000 active breweries, already contributes over €50 billion annually to the EU economy and generates over 2 million jobs throughout the beer value chain, “from grain to glass”. Supportive EU policies can help ensure that the competitive and innovative European beer sector continues to contribute to the EU’s top priority of ‘jobs, growth and investment’. “World Expo is the ideal platform for Europe’s brewers and our stakeholders to share knowledge and expertise. We make a major contribution to the EU economy both in terms of GDP and jobs, and I am thrilled that we will be joined by such a strong line-up of speakers, including global CEOs, EU policy-makers and renowned academics as we debate the beer sector’s contribution to growth in Europe”. Kicking off the day, the first panel discussion ‘Beer and a Balanced Lifestyle’ will look into the European brewing sector’s recent commitment to list ingredients and nutrition information, and consider the place for beer within an active lifestyle. The second panel discussion ‘Brewers and the EU Growth Agenda’, will examine how EU and national policies impact the growth and competitiveness of the brewing sector, offering perspectives on job creation, tax and exports, as well as the challenges in ensuring policies strike the right balance. Rounding off the day, the third panel discussion, ‘Beer, Brewers, Research and Innovation’ will bring together a panel of experts who are applying innovation in different ways, through the brewing process, across the entire value chain, and also in the promotion of responsible beer consumption. The full European Beer Day @ World Expo, Milan programme can be viewed here. 18 May 2015: One week ahead of the 35th Congress of the European Brewery Convention (EBC), The Brewers of Europe reiterates the importance of research, innovation and new technologies for the sustained growth of the European beer sector. Visiting Portugal for the third time, the bi-annual EBC Congress takes place in Porto from 24th to 28th May this year and will gather delegates from across the world. A predominantly industry audience will hear, view, discuss and challenge scientific and technical papers and posters, covering recent developments and breakthroughs in the brewing, malting and related industries. There are well over 5000 breweries in Europe that brew an estimated 38 billion litres of beer a year. All of these breweries are dependent on a diversity of businesses that help bring the product from grain to glass. The value chain encompasses the supply of agricultural products such as cereals and hops, the equipment and machinery used in the brewing process, and the packaging, transport and storage companies that help ensure a high quality product be distributed to the wholesalers, retailers, bars and cafés that distribute the final product. Just in Europe, brewing has a value chain that generates over 2 million jobs in the production and sale of beer. Researchers from around Europe and beyond (including Japan, the US, and Latin America) will present some of the latest scientific developments about beer and discuss the role that technology and innovation can play in the brewing process and for the brewing sector as a whole. As at previous EBC congresses, a trade show exhibition will also allow brewers to meet and mingle with industry suppliers and knowledge brokers. There are also expected to be up to a hundred young brewers and researchers, who represent the future of Europe’s beer sector. Founded in 1958, The Brewers of Europe unites the national brewers’ associations from 29 European countries to promote the unique contribution made by beer and brewers to Europe’s culture, economy and society. Founded in 1946, the European Brewery Convention (EBC) merged with The Brewers of Europe in 2007 to become the organisation’s scientific and technological arm. 5 May 2015: The Brewers of Europe supports UN Global Road Safety Week, running from 4th-10th May, including through a 3-year SMART drink-driving partnership with the EU-wide NGO the European Transport Safety Council (ETSC) as part of the organisations’ joint commitment under the European Alcohol and Health Forum. “Drink driving is another form of alcohol misuse, and we take our responsibility very seriously when it comes to helping address this scourge on society,” said Pierre Olivier Bergeron, Secretary General of The Brewers of Europe. A number of anti-drink-drive activities supported by Europe’s brewers are planned in the coming months, not least an event “SMART approaches to tackling drink driving" on 7 May at the Czech Ministry of Transport in Prague, hosted jointly by the ETSC and the Czech Transport Research Centre (CDV). This will look at the most effective measures to reduce alcohol-related road deaths and includes interventions from both the Slovak and the Czech brewers’ associations on “The role of the industry in tackling drink driving”. Other participants include representatives from both the Czech and the Slovak Transport Ministries, EU representatives, national stakeholders and decision-makers, together with road safety experts and campaigners from across Europe. The German brewers’ continued support to the Don't Drink and Drive (DDAD) campaign with a number of events in the coming months targeting drivers aged between 18 and 25 years. Irish brewers’ support to the national Drink Aware campaign in partnership with the national road safety authority, which reaches an estimated 70% of adults across Ireland. The Slovak brewers, in partnership with the Slovak police, planning the “Don’t Drink and Drive Day” for the third year in succession. In Spain, Harley Davidson bikers will be the main ambassadors for the long-running La Carretera Te Pide Sin campaign which recommends non-alcoholic beer in case people wish to enjoy a beer before driving. The Belgian Brewers will continue to support, with the Belgian road safety authority the BOB drink drive campaign that has now been running for over 20 years. The Dutch brewers continue to work with the Ministry of Infrastructure and Environment, provinces, municipalities, and road safety and alcohol awareness organisations on the Dutch BOB designated driver campaign which has been running since 2001. The Czech brewers support the campaign “When I drive I drink NA beer” to increase awareness of non-alcoholic beer as a safe alternative to drink driving. This is the result of a partnership between the Association, the police, and the Ministry of Transport. The Polish brewers have also formed strong partnerships with the Polish National Police, Ministries, road safety institutions, and transport companies as part of a programme to reduce levels of drink driving in the country. Following today’s adoption by the European Parliament of a Resolution on the EU Alcohol Strategy, The Brewers of Europe reiterates its support for an action-oriented, targeted approach to reducing alcohol-related harm. The Brewers welcome MEPs’ acknowledgement that moderate beer consumption by healthy adults can be fully compatible with a balanced lifestyle, highlighting the importance of fighting alcohol misuse and promoting responsible drinking behaviours. The ongoing EU Strategy differentiates amongst different drinking cultures and behaviours and rightly focuses on alcohol misuse, supporting Member States to address the problems caused by harmful drinking via targeted, locally relevant activities. As such, The Brewers of Europe supports the effective strengthening of the Strategy’s existing mechanisms and the strict enforcement of national legislation, rather than introducing a new top-down approach. Europe’s brewers have supported this Strategy since its adoption and have contributed over one third of the 325 commitments to action made in the EU Alcohol and Health Forum. The Brewers of Europe’s commitments are currently captured within a European Beer Pledge that was launched in the European Parliament in 2012 and focuses on consumer information, marketing self-regulation and campaigns against drink-driving, underage drinking, alcohol in pregnancy and binge drinking. We also take note of the European Parliament’s calls for action on consumer information, The Brewers of Europe having announced last month a voluntary move from brewing companies to list ingredients and nutrition information for beer, going beyond the EU laws that currently exempt alcoholic beverages over 1.2% ABV from the obligation to provide such information. Transparently bringing beer into line with the rules for non-alcoholic beverages will enable consumers to compare like-for-like information both on ingredients and on nutritional values, such as calorie content. Commissioner Hogan, responding on behalf of the EU’s Health Commissioner, announced at the end of the European Parliament’s debate that the European Commission would be coming forward with the long-awaited report on the matter in due course. As EU Health Ministers meet in Riga to discuss the future of the EU’s alcohol policy, The Brewers of Europe reiterates its support for a European approach that encourages targeted actions to reduce alcohol-related harm. The current EU Strategy to support Member States in reducing alcohol-related harm rightly focuses on alcohol misuse, addressing the problems caused by harmful drinking via targeted and local-level activities aimed at the minority who misuse alcohol. The Brewers of Europe has supported this Strategy throughout, not just through words, but also through actions, having filed one third of the 300 commitments to action made within the EU Alcohol and Health Forum. In addition, The Brewers recently announced a major voluntary move to improve consumer information and go beyond existing legal requirements by becoming the first alcoholic drinks sector to commit to listing ingredients and nutrition values for beers per 100ml, as is currently legally required for all non-alcoholic drinks, including non-alcoholic beer. Rolling out the commitment with the same reference point as is required for non-alcoholic beverages, brewers will not only be respecting the legal requirements of the EU Regulation on Food Information to Consumers to provide this information per 100ml but will also be meeting the logical wish of consumers to compare nutritional values across all available beverages, when this information is provided by the companies. The Brewers of Europe very much appreciates the support it has received from BEUC (the European consumer organisation) and Eurocare (the European alcohol policy alliance), as well as the European Commission, after announcing in the last week a major commitment to list ingredients and nutrition information for beer. Making this announcement we also encouraged other alcoholic drinks sectors to follow our lead and commitment to transparency in this endeavour. Unfortunately however, alongside the positive reactions from policymakers, consumers and NGOs, there have also been some negative reactions, going so far as to say that The Brewers of Europe is misleading consumers and undermining responsible drinking messages. We therefore felt it useful to clarify the situation. Whilst there is currently an exemption for alcoholic beverages over 1.2% ABV with regard to the provision of nutrition and ingredients information, it is mandatory for any producer voluntarily providing this information to follow the rules of the EU Regulation on Food Information to Consumers with regard to its display. This means that companies voluntarily committing to provide the nutritional values (e.g. calorie content) for beers are legally obliged to provide the information per 100ml. This is not just the legal point of reference for all beverages (alcoholic or non-alcoholic), it is also logical and has been understood by consumers for years, allowing them to easily compare information across all beverages on a level playing field. Furthermore, the EU Regulation makes it clear that absolutely nothing prevents economic operators today also additionally using other points of reference, such as portion sizes, alongside the well-known 100ml reference. “In addition to beer also being the first alcoholic drinks sector to commit to listing ingredients across Europe, when I see consumer research that shows consumers wish to receive the nutritional information too and NGOs, public health advocates and policymakers are lining up to welcome our voluntary initiative, it reinforces The Brewers of Europe’s conviction that what brewers have committed to doing is the right thing to do, in the interests of Europe’s consumers”, added Pierre-Olivier Bergeron. Following today’s adoption of a Resolution on the EU Alcohol Strategy by the European Parliament’s Committee on the Environment, Public Health and Food Safety, The Brewers of Europe reiterates its support for a European approach that encourages targeted actions to reduce alcohol-related harm. The current EU Strategy to support Member States in reducing alcohol-related harm rightly focuses on alcohol misuse, addressing the problems caused by harmful drinking via targeted and local-level activities aimed at the minority who misuse alcohol. Rather than introducing a new top-down approach, and given the diversity of consumption patterns in Europe, The Brewers of Europe supports the effective strengthening of the Strategy’s existing mechanisms that was suggested by its external evaluation. The Brewers of Europe believes that cooperation between alcohol stakeholders is essential in order to develop effective actions to reduce alcohol-related harm and supports today’s call by MEPs to encourage all stakeholders to participate in the EU Alcohol and Health Forum. The Brewers of Europe has supported this Strategy since its adoption and has contributed over a third of the 300 commitments to action made in the Forum. The Brewers of Europe also takes note of the MEPs’ calls for action on consumer information on alcohol beverages, having just announced a voluntary move from brewing companies to list ingredients and nutrition information per 100ml, in line with the legal requirements for all non-alcoholic drinks, including non-alcoholic beer. The information will progressively be provided across Europe by companies on pack and/or online, utilising an expanding range of consumer communication platform. Brewers will set targets and report on progress made, which will also go towards the implementation of the European Beer Pledge, a package of responsibility initiatives that was launched in the European Parliament in 2012. (1) The new survey published by GfK shows that 60% of European adults now own a smartphone. Also published today is a new survey by GfK on consumer knowledge of ingredients and nutritional declarations of alcoholic beverages and the use of online information. Contact The Brewers of Europe for more information. The Brewers of Europe welcomes the announcement by British Chancellor George Osborne that beer taxes will be cut for the third year running. The abolition of the so-called “beer duty escalator” (a previous system whereby beer tax was increased above inflation year on year) and a beer tax cut in 2013 and 2014 had already secured 16,000 jobs. What this latest announcement shows to other EU governments is that a water-tight case can be made for beer tax cuts as a means of stimulating investment, growth, jobs and ultimately new tax revenues for the government too. Beer generates over 2 million jobs across the EU and there are now well over 5000 breweries across the Continent. The sector went through tough times after 2008, with consumption in the EU dropping by 8% in just two years and the hospitality sector particularly suffering. At the same time many governments were increasing beer taxes in order to try and quickly gather money to plug gaps in their national budgets. However, increasingly governments, such as in Denmark and the UK, are also looking at the positive contribution the beer sector makes to growth, jobs and tax revenues. Hitting the beer sector with punitive taxes not only hurts the breweries but it also hurts the wider economy. Tax cuts on the other hand can boost the beer sector, support the brewing value chain and help beer support the overall economy. Italian Brewers managed to avert one tax hike in 2014 but were then hit with a new one on 1st January. That is why the Italian Brewers this week launched a new campaign to also help its consumers understand just how much of the cost of their beer is going to the tax authorities and the threat this poses to the sustainability of Italy’s burgeoning beer culture. For these reasons The Brewers of Europe strongly encourages EU Member States to consider the positive contribution that beer provides to the economy and choose an excise system that is supportive to beer, recognises the specifics of the beer category and enables beer to help stimulate economic recovery. The EU Single Market is working and encouraging competition between Member States, with the high price of beer in several high tax countries leading consumers to seek out more affordable alternatives in neighbouring countries. A new study by EY and Regioplan Policy Research analysing the economic impact of high excise duty rates shows that consumers are exercising their legitimate right to purchase beer where taxes (and prices) are lower. Customers may then find that their disposable income goes further in these lower tax countries, encouraging them to spend on a broad range of items. The main conclusions of the study stem from a consumer survey conducted by Ipsos Interactive Services among 3200 consumers in the Nordic countries (Denmark, Finland, Norway and Sweden). The high excise duty rates in the Nordic countries have led to multiple negative economic consequences in those higher tax countries. As this legitimate cross border trade grows it undermines the governments’ revenues and policy objectives and has the unintended consequence of disadvantaging local business. High taxes for beer also create an environment which encourages illicit trade, further reducing tax authority revenues. Increased cross border road traffic, resulting in environmental cost. The Brewers of Europe encourages higher tax countries to reflect on these challenges when setting excise rates and adopt a policy that seeks to reduce taxation of beer. Brussels, 9 February 2015. Euromalt, the European malting industry Association and the European Brewery Convention (EBC), the technical and scientific arm within The Brewers of Europe, have reached an important breakthrough in the research on gushing: in a joint research project with the German Research and Teaching Institute for Brewing in Berlin (VLB), a potential method to predict the gushing potential of malt and beer samples was identified. Gushing in beer refers to the phenomenon of uncontrolled evolution of foam or beer from a bottle that is not caused by movement or temperature. The exact reasons causing this physical reaction remain largely circumstantial at this point. In 2012, European maltsters and brewers decided to join forces to further research this common interest. In a tender process, VLB was awarded the contract with a total budget of € 260.000 which was equally shared by both associations to carry out the research project aimed at the identification of gushing-inducing factors. Over a period of two years, more than 200 commercial malt samples of the 2011, 2012 and 2013 harvest were collected from European maltings and breweries. A brewing scheme for the highly reproducible production of gushing positive and gushing negative beers at laboratory scale was established and validated. To monitor the level of fungal infection on the malt samples a quantitative real-time PCR method was developed, using species-specific primer pairs for relevant fusarium species. In general, the group of gushing positive malts had a significantly higher level of fungal infection than the gushing negative samples, but nevertheless it was not possible to establish a reliable regression model for the prediction of the gushing potential based on the fungal infection. Hydrophobin levels in gushing positive and gushing negative malts and beers were analysed via ELISA. Furthermore, hydrophobin levels in malt and beer were in good agreement with the total Fusarium cell number. As gushing positive samples generally had higher hydrophobin levels than gushing negative samples, it might be conceivable to determine a threshold for an increasing gushing risk. However, a reliable prediction model could not be proposed. Various sample preparation protocols for a MALDI-TOF MS analysis of malt extracts and beers were established. Using the most promising methods, analyses of the gushing positive and gushing negative reference samples were conducted and the acquired mass spectra statistically evaluated via multivariate data analysis. For malt samples three preparation methods lead to meaningful models with a high prediction capacity of the gushing potential. While the initial research centered on identifying and quantifying differences in the composition of gushing inducing and not gushing inducing malt samples, proved by small scale brews, promising results of using MALTDI-TOF MS analysis to make a differentiation between gushing positive and gushing negative malts and beers gave stimulus to further work in this area. Euromalt President Nicholas King: “This is a very promising result for the malting industry. However, there is still further work to be done. Eventually we would like to arrive at a simple test that can be used by maltsters in their everyday business”. EBC President Dr. Stefan Lustig: “This study is an excellent example of collaborative funding organised by the two Brussels-based associations, Euromalt and EBC (as the technical and scientific arm of The Brewers of Europe), arriving at scientific insights which will be of benefit to the whole brewing value chain, from grain to malt to finished beer and ultimately, the consumer. We are proud to share at this stage that the project has yielded very promising results. Assessing risk potential in gushing-prone malts has moved within our grasp”. Project leader at the VLB, Professor Dr. Frank Rath, will be speaking on the subject at the 35th EBC Congress taking place from 24-28 May in Porto, Portugal. The talk is scheduled for the morning of 25 May 2015, at the Congress Centre Alfândega. More information can be found here. Euromalt is the EU malting industry association and represents the interests of the European malting barley processors and malt producers. Euromalt’s members account for more than 60% of the world malt trade: with over 190 facilities in Europe, the sector provides around 28,000 direct employments. Its members process 12 million tonnes of malting barley of European origin to produce over 9 million tonnes of malt for the brewing industry in the EU, for export to overseas brewers as well as the distilling and food industries. EU foreign earnings from malt exports are about 0.90 billion euros. More information can be found on our website: www.euromalt.be. Based in Brussels, The Brewers of Europe brings together national brewers’ associations from 29 European countries and provides a voice to represent the united interests of Europe’s 5000+ breweries. The Brewers of Europe of Europe promotes the positive role played by beer and the brewing sector in Europe and advocates the creation of the right conditions to allow brewers to continue to freely, cost-effectively and responsibly brew and market beer across Europe. The European Brewery Convention (EBC) is defined as the technical and scientific arm of The Brewers of Europe. For further information, log onto: www.brewersofeurope.org. Brussels, 29 January 2015 - Following this morning’s debate in the European Parliament on a Draft Motion for a Resolution on the EU Alcohol Strategy, The Brewers of Europe reiterates its support for the current EU Strategy to support Member States in reducing alcohol-related harm. The external evaluation of the current EU Strategy was extremely positive, concluding that the priorities and approach remained relevant, whilst also proposing a strengthening of the existing mechanisms. The Brewers of Europe supports this call for a reinvigoration of the current strategy rather than a totally new approach. The current EU Strategy focuses on alcohol misuse, addressing the problems caused by harmful drinking patterns and targeting the vulnerable minority who either drink to excess or should not drink at all. Moderate beer consumption by healthy adults can be fully compatible with a balanced lifestyle, highlighting the importance of promoting responsible drinking behaviours. The Brewers of Europe has supported this Strategy throughout, not just through words but also through actions, having filed one third of the 300 commitments to action made in the EU Alcohol and Health Forum. The beer sector also reaffirmed its commitment in 2012 with the adoption of a European Beer Pledge that focuses on consumer information, marketing self-regulation and campaigns against alcohol misuse. The second annual report on the roll-out of the Beer Pledge was published in November 2014 and independently assured by KPMG. Demetrio Carceller, the first Spanish President of the association, will represent for a further two years a sector that contributes 52 billion euros to the European economy. Brussels, 4 December 2014. The Brewers of Europe’s General Assembly has unanimously re-elected Spanish brewer Demetrio Carceller to represent the European association that federates 29 national brewers associations across Europe. The EU has over 5500 breweries, which together brew 38 billion litres of beer annually. In Spain, the EU’s fourth largest beer market, beer represents 1.4% of national GDP. As President of Europe’s brewing sector, Carceller will continue the work of promoting the sector's contribution to the European society, culture and economy. Beer generates over 2 million direct and indirect jobs in Europe across the entire value chain, with one job in brewing creating one in agriculture, one in packaging and logistics, one in marketing and other services, one in retail and 11 in bars, pubs and restaurants. Breweries directly employ more than 125,000 people in Europe but also create a further 1.4 million jobs in the hospitality sector, according to the latest report by Ernst & Young. While the European context has been very difficult in recent years, beer exports increased by 11% between 2010 and 2013. It is also worth noting that, in spite of a decline, a third of beer consumption in Europe is still taking place in bars and restaurants, generating 76 billion euros in revenues in the hospitality sector - a positive sign. According to Demetrio Carceller, President of The Brewers of Europe, "the contribution of beer not only has an important economic dimension, but also a social and cultural one, given its historical roots in the continent". Carceller's re-appointment also highlights the importance of the Spanish beer sector to the EU’s economy and its food sector. In Spain, brewing and beer help create over 257,000 direct and indirect jobs, mostly in the hospitality sector, and generate an estimated 5.6 billion euros in tax revenues, of which around three quarters originates from consumption in bars, restaurants and cafés. A key focus of the next two years of Carceller’s Presidency will be a further step up in efforts to actively promote moderate beer consumption and its place within a balanced lifestyle. The Brewers of Europe’s Second Year Report on the European Beer Pledge shows Europe’s brewers’ are keeping to their promise to promote the responsible consumption of beer, increase consumer knowledge and strengthen responsible beer advertising. “This report shows how brewers across Europe have persisted in their efforts to step up in support of the EU Strategy to reduce alcohol-related harm, through concrete actions targeted at combating alcohol misuse,” said Pierre-Oliver Bergeron, Secretary General of The Brewers of Europe. The European Beer Pledge is a voluntary initiative by Europe’s brewers to support EU Member States in reducing alcohol related harm. Brewers made a commitment in the European Parliament and to the EU’s Alcohol and Health Forum, to take concerted and measurable action to improve consumer information, ensure responsible advertising and address alcohol misuse in line with the expectations of citizens and EU policymakers. Focusing on the new activities carried out between March 2013 and May 2014, this second interim report presents a snapshot of initiatives by brewers across Europe, through associations, by companies and in broad coalitions, in line with and contributing to the implementation of the European Beer Pledge. “The report, and the actions described therein, demonstrates the positive and large-scale voluntary actions that brewers can take, and are taking, to address alcohol misuse,” said Bergeron. The reporting period saw the brewing sector stepping up its activities, numerically, geographically, and in scope, with local partners including governments, driving schools, local authorities, doctors’ groups, consumer organisations, NGOs and police authorities. At EU-level The Brewers of Europe also continued its partnership with the EU-wide road safety NGO, the European Transport Safety Council. The Brewers of Europe is looking to further build on its activities in 2015 and beyond, with a particular focus on empowering consumers with the right information to make informed choices, and campaigns that actively promote moderate beer consumption and its place within a balanced lifestyle. Ensuring that marketing self-regulation mechanisms remain equipped to deal with new media will also be a key priority. With an EU Strategy that remains targeted at alcohol misuse and recognises the contributions that all parties can make, the European Commission can depend on the support of Europe’s brewers, at EU and local level, through focused actions in partnership with other key stakeholders. The below piece by Pierre-Olivier Bergeron, Secretary General of The Brewers of Europe, was published on 25 November 2014 both in the online and print editions of the Parliament Magazine as part of a special feature on the EU Strategy to support Member States in reducing alcohol-related harm. When consumed in moderation and responsibly by healthy adults, beer can be enjoyed on many occasions and may be fully compatible with a balanced and active lifestyle. However, alcohol misuse is a serious problem and one that brewers are fully committed to tackling, including through the existing EU strategy to support member states in reducing alcohol-related harm. Since 2006, when the current EU strategy was adopted, beer consumption in the EU28 has actually declined by nine per cent. If simply reducing overall consumption was its aim, then the strategy has been a success when it comes to beer. But this misses the point. The strategy identified more relevant aims: tackling alcohol misuse and reducing alcohol-related harm. The most recent Eurobarometer looking at alcohol showed that 69 per cent of drinkers have two drinks or less when they consume. Furthermore, only one in 10 of those who had consumed alcohol in the last 30 days reported having five or more drinks per session. It is clear that we need to be targeting the minority who consume irresponsibly, not the whole population, moderate and responsible consumers included. And we have had success in Europe. While the lack of quality, up-to-date data remains a source of frustration both for policymakers and brewers alike, we can see gradual improvements. The proportion of people who never drink more than five drinks in one sitting increased from 31 per cent to 34 per cent between 2006 and 2009. More impressively, drink driving related deaths plummeted by 51 per cent between 2001 and 2010. Drink driving is an important case study. Brewers, policymakers and NGOs agree that drinking and driving don't mix. It has simply become socially unacceptable behaviour in a number of countries. And what is the approach? It's simple. Enforcement of the laws, combined with awareness raising activities, with all stakeholders working towards a common goal. Brewers are responsible for 100 of the commitments in the EU's alcohol and health forum. This is one third of the total number. But perhaps the most interesting figure is that only one of the 300 commitments is an EU-wide partnership between an EU-level industry association, in this case The Brewers of Europe, and an EU-level NGO, in this case the European transport safety council. At the national level, brewers work together with local authorities, doctors' groups, road safety authorities, educators, police, NGOs and consumer groups. The current EU strategy sets the right priorities. The evaluation conducted by the commission concluded that the priorities and approach remained relevant. But the strategy may need reinvigorating. We could set targets, for example on the numbers of underage people regularly consuming alcohol, or on road fatalities linked to alcohol. Let's work together. Parties may have different opinions or motivations behind taking action, but we can all agree that alcohol-related harm needs to be addressed. We need a long-term approach but we also need measurable and achievable indicators to help ensure we are on the right track. What the drink driving experience shows us is that things can be improved, attitudes can change and we can all learn from each other. Pierre-Olivier Bergeron is Secretary General of The Brewers of Europe, which unites 29 national brewers associations from across Europe to support the interests of Europe's 5500 breweries. "I am delighted to take over the EP Beer Club chairmanship for the current mandate. Beer has always been part of our rich European culture and it is of vital importance for our economy. The European Parliament is committed to do more for economic growth and employment. In order to support our enterprises we need to ensure that European legislation is feasible in practice. This would also support the brewing sector in fulfilling its potential and in successfully continuing its commitment to Europe."